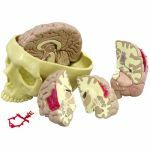 Full size segmented brain features half normal side and 3 piece sectioned pathology half, as well as Circle of Willis with aneurysm. The brain, which sits inside a partial skull, features the following pathologies which are described in detail on the accompanying educational card: alcoholism, Alzheimer's, aneurysm, depression related tumor, seizure related tumor, migraine, multiple sclerosis, Parkinson's disease, stroke, and subdural hematoma. 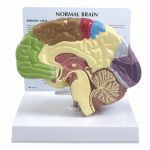 Model size: 5" x 6 3/4" x 5"
Suitable for neurology, general anatomical study, training for surgical dissection, general medicine, or for patient education/demonstration of procedures. 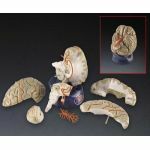 Notice to Sales and Marketing Directors: Custom Imprinted Anatomical Models Available for Customer Promotions. Please Contact Us at 1-847-234-3524 for More Information.